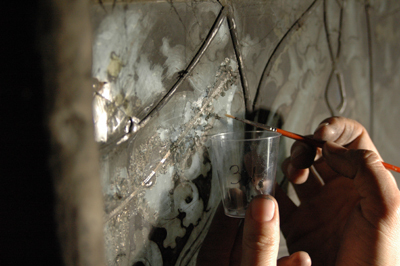 In preliminary testing, we differentiate between analyses in the context of the development of preservation and conservation concepts on one hand and the analyses performed on the still-installed glass windows immediately prior to the start of conservation work. The latter ensures that these glass paintings can be removed with a suitable technique and brought to the studio. In the context of these preliminary tests, measures such as temporary paint-layer preservation are performed – threatened slabs secured with specifically-engineered custom covers or the condition of the glass paintings is documented prior to removal. The removal itself takes place very painstakingly as insofar as possible, without jarring. With the aid of custom-designed carrier boxes, even fragile lead fields can be securely transported from the scaffolding. After the transport of the removed glass windows to the studio, as a rule, an extended preliminary test is performed. In this context, the initial sampling measures are taken to be able to resolve an optimum conservations concept at a subsequent studio meeting with all decision makers involved.